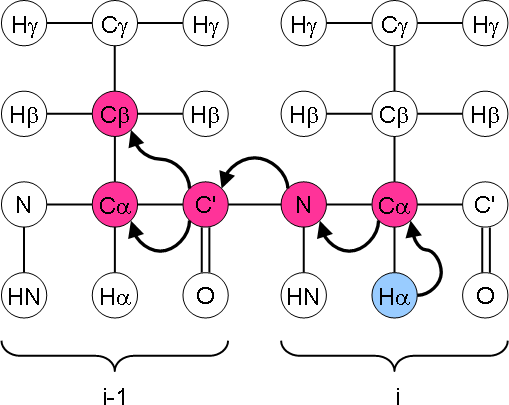 Magnetisation is transferred from 1H to 13Cα via cross polarisation and then selectively to the 15N using specific cross polarisation. A further specific cross polarisation step is used to transfer the magnetisation onto 13CO nuclei. Finally a PDSD step is used to transfer the magnetisation to any other 13C nuclei nearby. The chemical shift is evolved on the 13Cα, 15N and 13CO nuclei and then detected on 13C. Lower dimensionalities are also possible by eliminating one or both of the 15N and 13CO evolution periods. This experiment is extremely useful for assignment, providing useful quasi-through-bond links between two sequential residues with a further, e.g. Cαi-Ni-COi-1-Cαi-1 and decreasing overlap problems on account of its being a 4D experiment. As with the CANCO, the main problem with this experiment is its low signal-to-noise. The three CP transfers tend to have fairly low transfer efficiency. On a sample which suffers from low signal-to-noise anyway, there may not be enough signal left to detect anything at the end of this experiment. However, if you do get this to work, then a small protein can be assigned very easily using this experiment (see Franks et al. 2007).